Lisa Guthrie has a lifelong interest in watercolor painting. Daughter of noted Northwest painter, Lance Wood Hart, Guthrie was encouraged from an early age to paint and draw. Along with her career as a landscape architect she especially enjoys plain air painting in Marin County and the Bay Area. Favorite subjects are landscapes which include architectural elements. Sketchbooks are an important part of plein air work and are a treasured accessory during travels. Guthrie has taught workshops in the Bay Area, as well as various locations in the US, France and Italy. 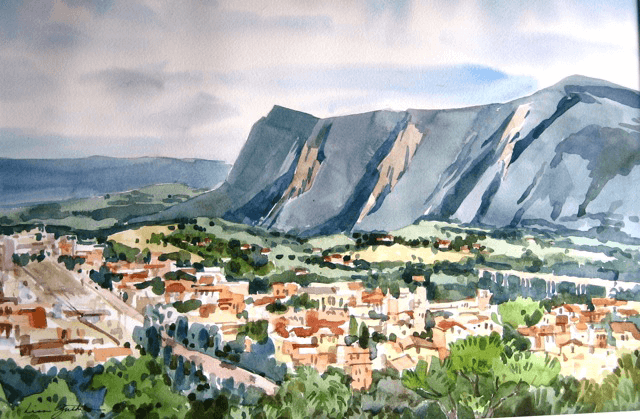 She has been fortunate to enjoy a long time association with La Romita School of Art in Umbria, where she has taught numerous workshops. In addition, Guthrie has conducted non-instructed trips to France and Italy for painters to enjoy En plein air painting. 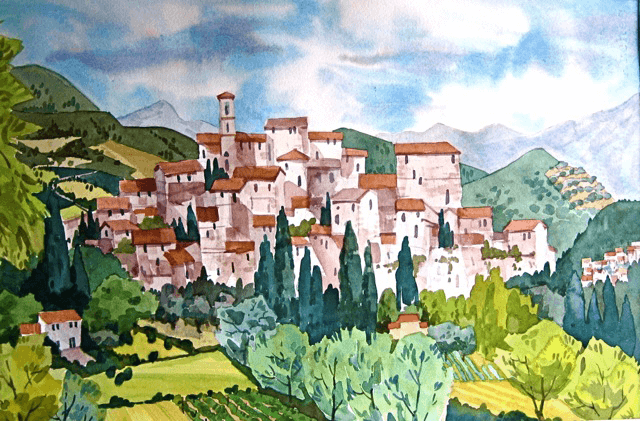 Amina: What is it about watercolors that you found—and still find–so appealing? Amina: What is it that inspires you to paint a particular subject? Lisa: I like to project myself into a scene, I like to physically relate to it, which is why plein air painting appeals to me… when you get out into the field and have to decide what you want ot paint and how to get it onto a piece of paper when you have this vast landscape in front of you. I don’t do trees and rocks and scenes, but I can do buildings and landscapes because that’s what I relate to. I don’t like to work from photographs, because all you have is a tiny 5 by 7 [inch photo] and then you to put it on a paper that’s 10 times the size…[For me] it’s seeing something that I want to remember and that I want to have a personal relationship with.